Many other Commercial and Industrial applications. With the CONTAINER FRIENDLY SERIES the Containers are easily interchangeable without changing the compactor, ranging from the containers that are tipped onsite to the RollOffs that are hauled to the Landfill. The Container choices are 4 Yard Front Load, 6 Yard Front Load, 6 Yard Rear Load, 8 Yard Front Load and 17 Yard Roll-Off. The Containers are interchangeable so that changes in trash volume can easily be adapted to without changing the compactor. The Container Friendly Series also is very Hauler Friendly . In addition to the Drivers Light Feature there is also an Automatic Latch System so that Front Load Drivers never have to leave their truck to tip the Containers or Dumpsters. For Roll-Off Drivers there is a Hydraulic Unlatch and Lift System that opens the rear door so they can dump the trash load without getting out of their truck. 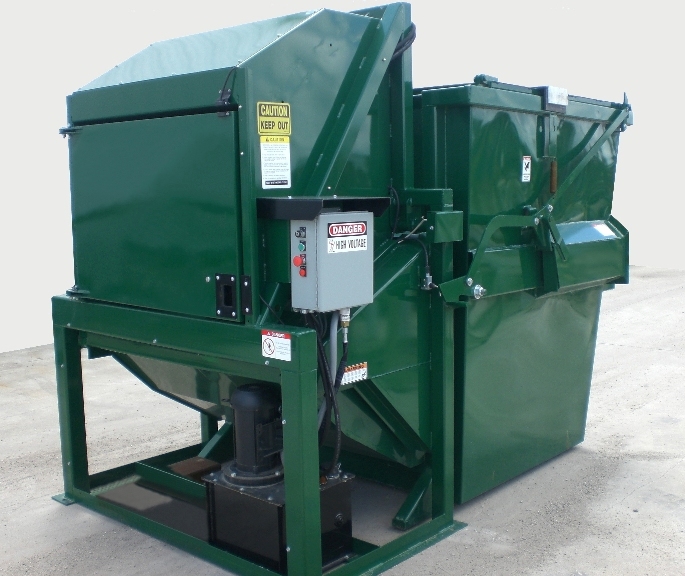 A Remote Control Panel is placed inside so the compactor is easy to operate. There are many standard features that add to the user-friendliness and safety of these Compactors. The main disadvantage with this series is that the hauler can only approach from the direction that is directly opposite the Chute Feed Wall. With the SITE FRIENDLY Series the biggest advantage is the flexibility of being able to situate or lay out the compactor arrangement since the hauler can approach it for pick-up from any one of three directions. (The only direction or side of the compactor arrangement unavailable to the hauler is the side where the Chute Feed Wall is located but the other 3 sides are available to choose from.) . 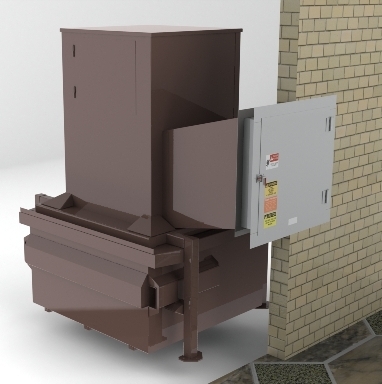 When site conditions make it difficult for outher types of Thru-The-Wall Compactor installations, this series can usually fill the void. The Container choices with the Site Friendly Series is 3 Yard Front Load, 4 Yard Front Load, 4 Yard Rear Load, 5 yard Front Load, 6 Yard Front Load and 8 yard Front Load. The Hydraulic Lines are not attached to the Container which means the hauler does not have to exit the truck. Just like the Container Friendly Series, Remote Control operation is a Standard Feature. The Compactor also has legs that can be vertically adjusted to allow for the 5 different size containers. One of the small disadvantages of the Site Friendly Series over the Container Friendly Series is that the Compactor requires an extra two feet in height. Also, if there is a Container Change (for example from a 4 yard to an 8 yard) it would require leg extensions for the compactor which is an additional charge (approx $300) in addition to the new container cost.